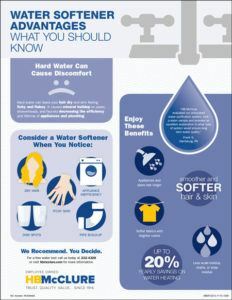 Benefits: Softening hard water not only feels better on your skin, it reduces various expenses such as soaps and cleaners (up to 70% per year), hot water heating (up to 27% per year) and fabric replacements (linens last up to 30% longer). You feel better, your dishes, skin and fabrics look better and your costs go down. Consider it when: The effect of your hard water is noticeable including spots on dishes and glasses; bathroom and kitchen fixtures are hard to clean or extra dry skin does not respond to routine moisturizing. Water Softener – A virtually comprehensive system that includes brine well, safety float, top and bottom distributors, and gravel unbedding. Reverse Osmosis – Reverse Osmosis (RO) systems purify your water on demand and provide better tasting beverages and healthier, high-quality water. Ultraviolet Sterilizers – Ultraviolet disinfection systems are designed to meet potable water requirements. This will safely destroy most waterborne disease-causing micro-organisms, providing you with high-quality, purified water. Consider it when: Health concerns or a desire to improve water quality overall determine that a whole-house filtration system is your best option. Whole House Big Blue HFPP-20 – The 20 micron filter is versatile enough to meet all filtration needs including high flow and heavy sediment applications. Other options are available. Benefits: Hot water instantly. No more wasting water by running the tap, waiting for hot water. Reduce water and heating costs. Consider it when: Energy savings or water savings are important issues for your home and family. Grundfos Hot Water Recirculation System – Eliminate cold water runoff at the faucet using a bypass value and pump with a timer to control water flow. Hot water is instantly available at sinks, appliances and bathroom faucets with easy-to-use Model UP15-10SU7PTLC. Includes a 24-hour programmable timer to make hot water available during peak demand times such as early in the morning and in the evening. Benefits: Keeping a dry basement is a challenge for some home owners. Avoid damage with a reliable Zoeller® sump pump. Consider it when: You have already incurred damage from a plumbing or storm-related emergency, are prone to water infiltration during storms, or are seeking peace of mind and added protection for your home. 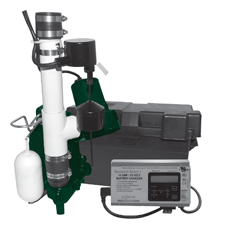 ZOELLER® Sump Pump – HB McClure can install a reliable Zoeller® sump pump. We can install a pre-assembled battery back-up version that holds its charge for up to 7.5 hrs of continuous operation. This unit can serve as a second stage pump while providing extra protection should you experience a power outage. Download HB McClure’s Water Systems and Plumbing brochure.